In the fall of 2016, life circumstance shifted and for the first time in years I had an extended period where I wasn't involved in a regular campaign as a player or referee. Since then things picked up and now I am refereeing two campaigns, and playing in a third. Along with refereeing at a local games once every other month or so. The key for me is using Virtual Tabletops like Fantasy Grounds or Roll20. With the different work schedules and driving distances involved it hard together with my friends and other folks to game face to face. It started back in the early 2000s as a way for +Dwayne Gillingham, +Tim Shorts, and I to continue to game together despite Dwayne moving from post to post while he was in the military. Since then I met several good friends on-line like +Ken H, and +Chris C. who became regulars, Since they are scattered across the northeast of the United States the only way for all of us to game on a regular basis is by using a VTT. Unlike MMORPGs, VTT or Virtual Tabletop compliments face to face tabletop roleplaying. 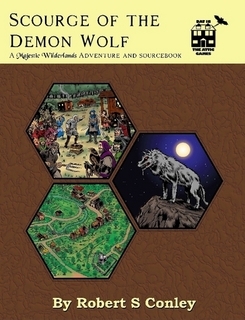 By using Voice over Internet, text chat, built-in RPG utilities, and a whiteboard that anybody can draw on, the software successfully allows people play tabletop roleplaying using the internet. It does have issues but they are the same issues that accompany any use of the internet for group collaboration, familiar to anybody who had to sit through a phone or internet conference at work. But it does brings some advantages especially if you use miniatures like I do. The easiest to use is Fog of War where a map displayed and the referee can selectively reveal different sections. The key thing to remember is that VTTs work alongside face to face gaming. You can easily run a campaign that regularly uses Roll20 and then once in a while get together for a face to face session. You are using the same material, the same techniques, and for the most part the same prep for both. Since I been using VTTs so long, I assembled a set of tools that help me during a session. First off I have a bit of an unusual setup for my computer where I have three monitors. The central one is oriented normally, while the outer two are in portrait modes. I do this primarily for writing where I can see an entire page at once on the right monitor. An entire page at one on the left, And have some other program running in the middle. Here what my setup looks like during a session of Roll20. This one is a slice of the Barrowmaze which the party stumbled on during my OD&D/Majestic Wilderlands campaign on Thursday. I have a old D&D 3.X utility called DM Genie on the left because it time keeping utility is still very useful. I have NBos' the Keep on the right to keep notes on and keep things organized. And in the middle is the web browser on the Roll20 site. We are using a VoIP program called Discord which is my current goto app for this stuff. You can see the fog of war in action in the area that look a darker gray compared to the rest of the map. Those areas are unrevealed and look black to the players. While my Thursday campaign is using my Majestic Fantasy rules (based on Swords and Wizardry), Wednesday using Adventures in Middle Earth which is based on DnD 5th edition. It is perhaps the best 5th edition third party supplement out there and it been outstanding to play. Overall it is low fantasy take on the 5th edition rules and has a very different feel despite most of the mechanics being the same. Periodically the ICv2 gaming news site does a survey and releases the top 5 rankings for retail stores. And lo and behold Adventures in Middle Earth popped in this spring at #4. Congrats to Cubicle 7 for their success. The only downside is that the rules have the minimum for open content and uses "everything derived from the SRD is open content everything else is product identity" without clearly marking anything. But it does get the creatives juices going about the possibility of low fantasy gaming with classic editions of DnD and 5th edition. For those interested Enworld keeps a history of ICv2 rankings. All we need to get one of the many excellent OSR RPGs to pop up in there. Cubicle 7 has been giving AiME a lot of support as well as you can see from here. Also note that The One Ring sourcebooks have been proving useful as well. Although keep an eye on the AiME release schedule as the AiME book duplicate a lot of the ToR setting information. To Cubicle's credit the AiME version it not just the ToR version with 5e stat blocks but obviously a refined and often better organized than the original ToR verison. I seem to be doing a lot of them recently. This is a result of me getting close to finishing the map of the Main Campaign Area. The players are establishing themselves as merchant and managed to buy a ship. So I made a map centered on the Trident Gulf to use to plan for voyage and to act as a reference. For good measure I also started a political map. This is for my campaign circa 4475 BCCC. The Majestic Wilderlands supplement reference how things were in 4436 BCCC. Those with the book can see there been several changes. Mainly the Council of Viridstan and the Dragon Empire. Both entities came into being as a result of PCs doing their thing during their respective campaigns. The Council of Viridstan originated from the Fantasy Hero campaign I ran in college during the late 80s. 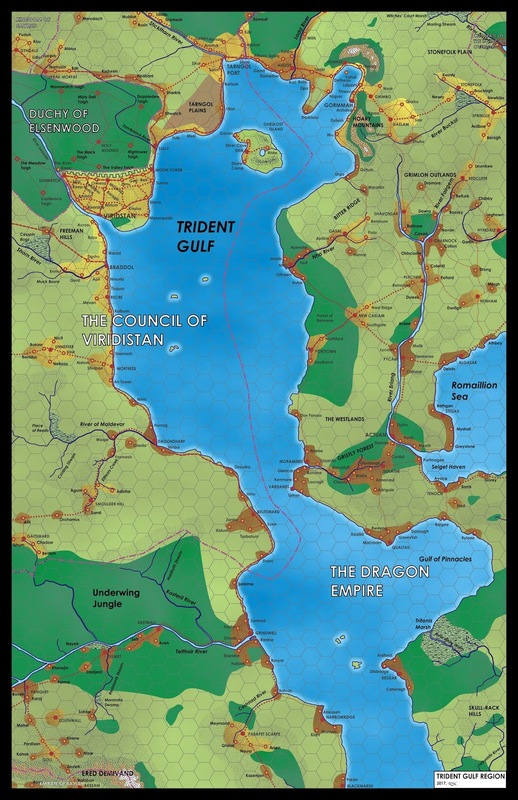 While the Dragon Empire resulted from a GURPS campaign I ran in the early 90s. 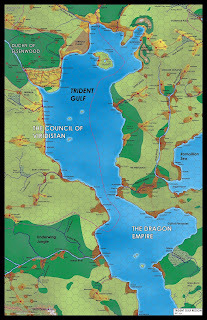 The odd extension of the Dragon Empire around the Tiethoir River was one of the last things we did in that campaign. I took GURPS 3rd edition Mass Combat rules and combined with a little bit of Harn for the logistics and cost. The last couple of sessions saw +Tim Shorts and +Dwayne Gillingham play William the Conqueror and the Normans. 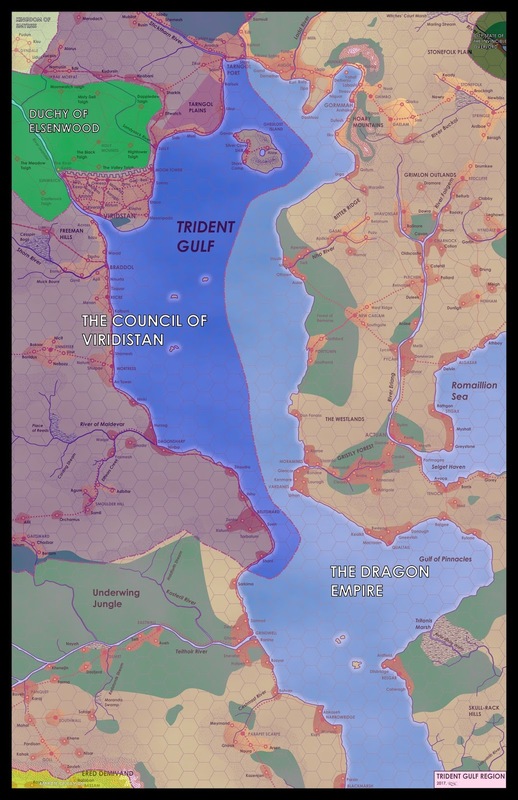 The whole thing was to allow Duke Draco-lindus (Tim's Character) and his allies to gain a power base outside of the thumb of the Invincible Overlord of City-State. Proved useful when Duke Draco broke away from City-State and reestablished the Dragon Empire. At least not from Noble Knight Games. Now some authors would be all up in arms about somebody obviously price gouging their own products. Especially when it still available for sale at it original price of $15 at Lulu and RPGNow. I am enough of a libertarian that I support the right for Noble Knights to do this. But I will take advantage of my right to mock them for trying to rip off an unsuspecting buyer. Looking at some of +James Raggi stuff is not passing the smell test in my opinion. Again it Nobles Knight right to sell the material they have for whatever the market will bear and it our right to mock them for it when it get ridiculous. Especially when they have a shaky reputation due to the fact they don't post actual pictures of the high dollar collectibles they are selling. UPDATE: After reading various comments, I want to stress rarely in life anybody is complete villain. Noble Knights has been in business a long time with a good reputation for service. I placed several orders with them over the years with no issues except for one minor one where I got the wrong cover. But since it was the only one they had and I wanted the content as well, I was fine with it. However for long time there been complaints about their refusal to post actual pictures and there been incidents with high dollar items that would have been adverted if they had. You can search the Acaeum forum to read about other collectors experiences.But for the most part they do verbally report the accurate condition of the product. Then there is there pricing which always been on the high side. Although bargains are not hard to find over time. However marking various readily available OSR product up at 100%? There no excuse for that. It is a decision that warrants mocking and criticism until it is addressed. Finally I want to thank +Erik Tenkar for getting the word out about this on his blog. FURTHER UPDATE: I had a nice exchange with Naomi from Noble Knights Sales. So the prices has been updated which you can see here. It is slightly higher but that in line from what I know about how vendor like Noble Knights operate. I don't know how much they paid for it but given their history of service I will take their word that what they need for a proper profit. So kudos to Naomi and Noble Knight Gams for responding promptly. Still need to use actual picture tho. As for the rest of the OSR people need to make sure they are on their toes. If you have pertinent information or an OSR author of one the products list then contact Noble Knights at sales@nobleknight.com. Be polite!